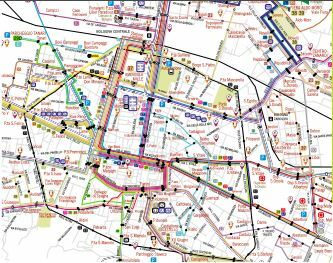 The most up-to-date public transport maps for Bologna Italy are on the website of the TPER bus company. Old maps produced by ATC are still on many other websites but these may be out of date as ATC went into liquidation in 2014. Click the thumbnail map to see the list of available pdf maps for Bologna (You may need to scroll down the TPER page to reach the pdf download area). These maps include public transport routes in the whole city, central routes only, with different maps for weekdays and weekends or holidays, and regional bus and train maps.